Over the course of the Easter long weekend (Friday April 19th to Sunday April 21st) I will be putting on an 'Easter Egg Hunt', hiding a dozen bunnies and eggs across 3 cities; Brisbane, Melbourne & Sydney. 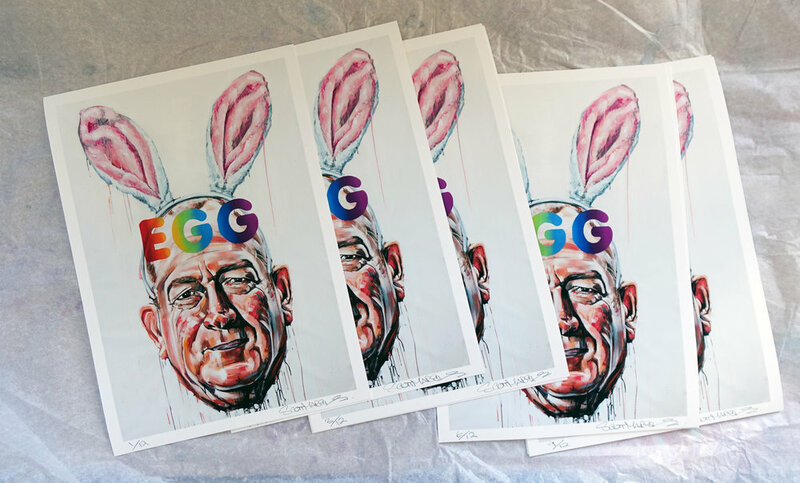 If you are the first person to locate and 'feed' one of the Easter Bunnies their eggs, you will win one of a dozen limited edition Easter Bunny fine art prints. Follow my Instagram (@scottie.marsh) for the location of each Bunny throughout Friday, Saturday and Sunday. There is a Golden Egg bonus prize. 2 eggs contain gold paint - if you ‘feed’ the bunny a Golden Egg, you'll be able to choose any original artwork from my web store ( www.scottmarsh.com.au ), valued up to $4000. The Easter Bunny loves his eggs! Feel free to get into the spirit of Easter and BYO eggs to feed the bunnies. 1 bonus print will go to the most creative egg video. *Original artworks delivered un-stretched in postage tube to locations outside of Sydney.